Here's a real gem and total justification for the existence of the B-movie. 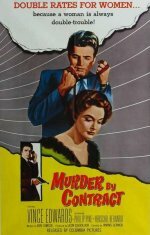 X-certificated in the UK on release, this darkly sinister plot masks a deeply original screenplay proffering philosophical insights into what makes hitman Vince Edwards (long before his role as TV doctor Ben Casey) tick. Ostensibly he wants more cash on discovering that his victim is female, but really he begins to ruminate on himself and his ambitions. Stunningly well directed by Irving Lerner and cleverly produced on a shoestring, this might be called pretentious by some; another view is that it's original, clever and absorbing. Also tough as nails.